To learn how to kick the crap out of other people, etc., etc. Those are all valid reasons, but the only one that really matters is the reason you are interested in the martial arts. So ask yourself, what do I really want? Why am I interested in training a martial art? That question and the answers you find will help guide you to the right martial art. Ultimately, this is a very personal question, and the answer depends entirely on where you are in your life, and where you want your path to take you. In a spirit of full disclosure, you are reading this article on an Aikido website, so it’s going to be a little biased. However, at the same time, I think it’s fair to write an article like this (bias and all), because your journey is probably not so very different from mine. We both started at some point with an interest in the martial arts, and (sooner or later) decided to pursue it further. I’ll tell you a little of my story and how I ended up in Aikido. Maybe it will help you a little on your personal journey. 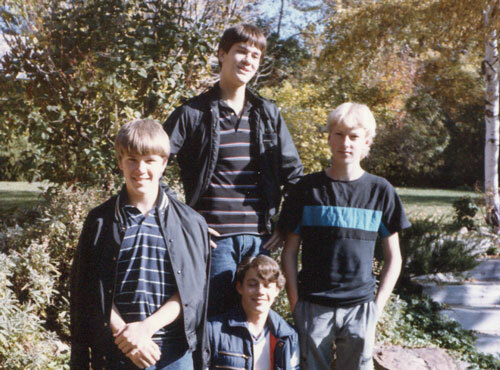 The author (center back) at age 15 with friends, Oct. 1985. I began my training in the martial arts at about the age of 15. I started taking Kenpo Karate because my friend took it—a pretty common beginning I think. It was cool; it built my confidence; and it was a lot of fun. Naturally, being a teenager, I thought I was pretty tough, and Kenpo appealed to my teenage machismo. This was the era of the Karate Kid after all (mid-80s) After a few months, I dropped out because my parents weren’t very supportive, and I couldn’t afford the classes on my own. My friend continued training and not only got black belt in Kenpo, but belts in a couple of other styles as well. 25 years later: I was in my late 30s, I had gained a lot of weight, and I had been wishing my whole life that I had continued taking martial arts. So when I finally got up the courage to change my lifestyle, I lost a bunch of weight and decided it was time to explore martial arts again. It was time to stop regretting the past and pursue one of my bucket list items with a vengeance. 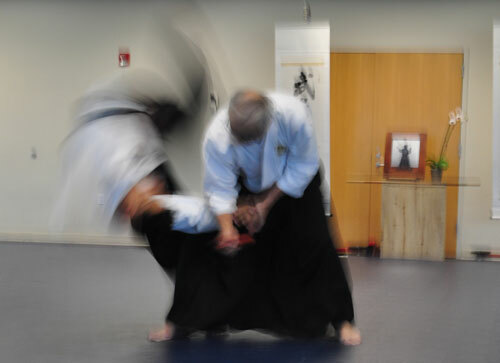 The author throwing his teacher, Dec. 2011. So based on these criteria, I checked out a lot of different styles: Northern Shaolin, Wing Chun, Jeet Kune Do, Taekwondo, to name a few. But none of them felt right. So I kept looking. So the next day, I started looking at Aikido dojos. I found one that looked promising, contacted the instructor for information, and went to observe a class. I liked what I saw, and I liked the instructor, so I went out and bought a gi and showed up for the next class. And I’ve been training ever since, nearly eight years now. I received my 2nd degree black belt (ni-dan) in 2016. 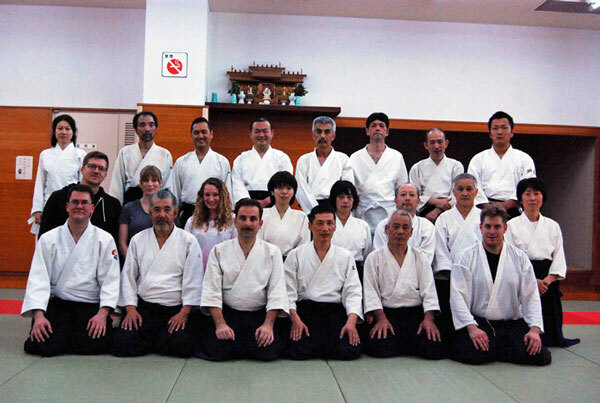 The author (front left) at Sakura Dojo in Japan on the day he was tested for shodan (black belt), May 2014. Honestly, I didn’t know that much about Aikido the first time I went to that class, but I liked the feeling in the dojo. Then as I began to research more about Aikido, I found that it was very compatible with who I was and my personal beliefs. Here are some of the reasons I continued to train, and why I have come to have an abiding love of the Art of Peace. 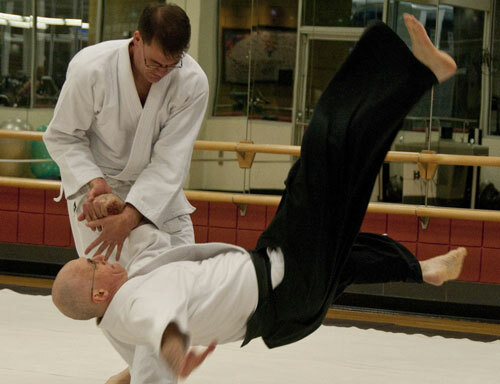 Yes, you can get injured training Aikido, but generally speaking it’s very safe. There aren’t any people aggressively trying to punch or kick you. Yes, we train against punches and kicks, but we train in a cooperative manner not a combative one, because we don’t want to actually hurt each other. There is no sparring or competitions in Aikido. You can set your own speed. 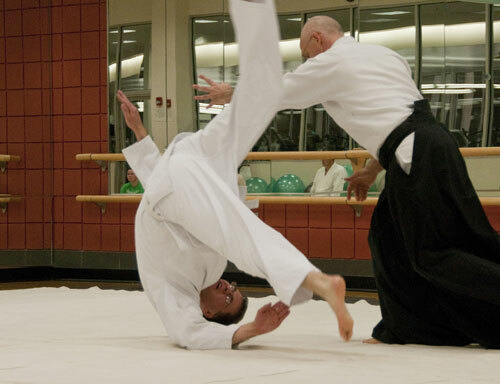 Aikido can be very fast, but you can choose how “hard” or “soft” you want it to be. We learn to be “friends” with the ground. The biggest risks are usually at the very first, when you are still learning how to fall safely. But if you are careful and pace yourself—and not take unnecessary risks—you’ll quickly learn how to fall safely, even if you are thrown at very high speed by your training partner. 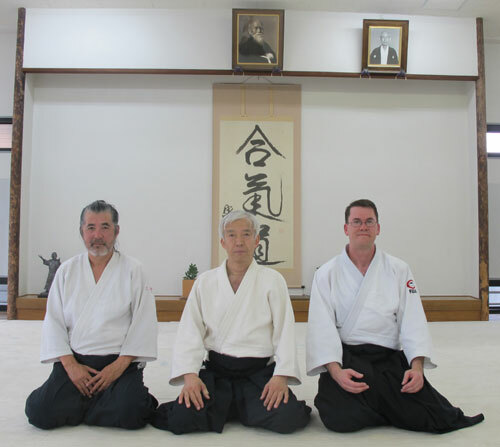 Maruyama Sensei (7th dan Aikikai Aikido), May 2015. Aikido can be enjoyed at any age (from 8-80+). If you are reasonably fit and careful when you begin your training, you can train well into your late adulthood. One of the great things about Aikido is that the better you get at it, the less physical strength it requires. Aikido uses physics and internal energy (“ki”) that allow you to make very powerful movements using a minimum of muscle. In fact, if you “muscle” a technique, you are usually doing it wrong. Some of the most powerful Aikidoists in the world are in their 70s and 80s, so age is not a limitation. The age-friendly aspect of Aikido is very different from most martial arts. Many arts are simply too aggressive or require too much physical strength/agility to continue training after you reach a certain age or physical condition. Aikido is known as the Art of Peace for many reasons. It was developed by founder Morehei Ueshiba in direct response to the horrors of war. O Sensei (“great teacher”) believed that martial arts training could be a path to peace. However, it meant martial training in a different way. 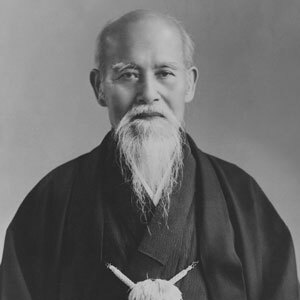 Instead of teaching people how to fight, maim, or even kill, Ueshiba believed that martial training and its positive values—discipline, respect, honor, integrity, loyalty, humility—could help people to become better people in every way. This is the focus of training Aikido. “Aiki” as defined by O Sensei’s son and successor, Kisshomaru Ueshiba, in his book The Spirit of Aikido, “is the power of harmony, of all beings, all things working together.” It starts by learning to harmonize with yourself—mind, body, and spirit (which is a lot harder than you might think). Next, you learn to harmonize with others, starting with your training partners. Finally, you work to harmonize with everything else (the rest of the Universe). Harmony and the connection between you and those around you is a fundamental principle of Aikido. At the end of the day, for me Aikido has application far beyond the walls of the dojo. Yes, it is fun, great exercise, mentally and physically challenging, and builds friendships that will last a lifetime. But perhaps more important, Aikido teaches principles of peace, kindness, humility, and harmony that can be applied to every aspect of life. Yes, I have learned some powerful martial techniques, but more importantly, I have learned to accept, blend, and harmonize with the world around me, and I like to think it’s helped make my part of the world a slightly better place to live. Thanks for reading about my journey to find the right martial art. That journey has turned into a much longer one that I expect to last the rest of my life. Training martial arts is not about the destination (getting a black belt or whatever), it’s about following a path that can influence and enrich your life. I wish you the very best on your own journey. I hope we meet along the way. The author (right) with Aikido Doshu Moriteru Ueshiba at Hombu, Tokyo, Japan, May 2014. About the Author: Gerry Carpenter (2nd Dan Aikikai Aikido) is co-owner of Aikido of Salt Lake located near downtown Salt Lake City, Utah. 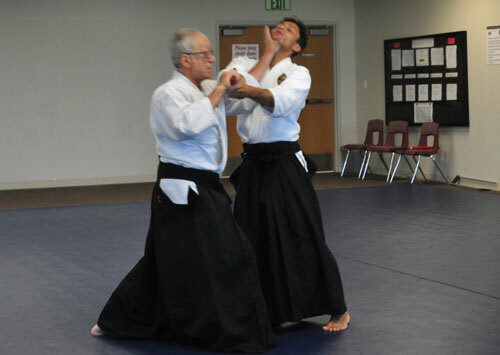 His teachers include Philippe Wyffels (4th Dan Aikikai Aikido) of Salt Lake City and Roberto Maruyama (7th Dan Aikikai Aikido) of São Paulo, Brazil.